I hadn’t really thought of RSS as a tool for education but it can be. If a student is doing research on a subject that’s in the news it can be useful. And certainly it’s useful for me. During the last week I’ve spent a lot of time reading articles online. 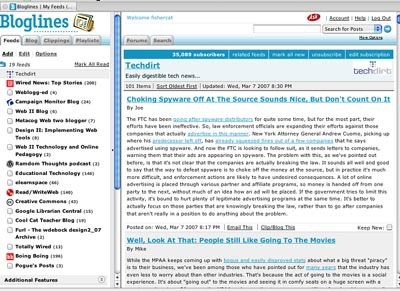 In class we were asked to get an acount at Bloglines, which I did but I recently found another RSS aggregator that I like a lot better, called Netvibes. I have used the live feed feature of Firefox too but Netvibes is more visual. You can move modules around and it’s like a browser page that you can set up tabs on, so for instance I have the main tab for news feeds, weather, etc and a second tab for blogs about online education. You can see (well actually I guess you can’t see all that well. 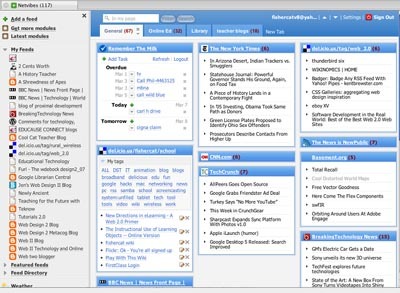 I’ll fix the screenshots tommorow) I have a module for my del.icio.us bookmarks there, which is pretty handy. Also a to do list which I have been using to jot down what groceries I have to pick up on the way home (not that that means I’ll actually remember what to get by the time I arrive at the store) It’s a little more involved to add a feed, you have to have the URL of the site you want the feed from all copied, but I like this much better than Bloglines. I mean look at the contrast between the way they’re set up. To read at Bloglines, you have to click the feed, then the stuff appears in the right side there. Well Netvibes gives you a little preview of the story or blog post or what haveyou and when you click the link the story opens in a separate window. Anyhow, I just think it’s far superior to Bloglines. I have a separate tab with feeds to all the class blogs as well as some blogs pertaining to online education and related technologies.